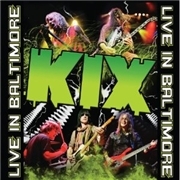 KIX were in your face Rock´n´Roll with more attitude than most back in their heyday. Founded back in 1978 they released their self-titled first album in 1981, but better things were still to come. More albums followed; “Cool Kids” in 1983, “Midnight Dynamite” in 1985 and in 1988, things really moved. “Blow My Fuse” went platinum and the ballad “Don´t Close Your Eyes” paved the way for the band. The follow-up “Hot Wire” came in 1991, and they cut a live album “KIX live, on tour in Holland. The rise of grunge was a hard blow for the band, and they threw in the towel in 1995 after their final effort “Show Business”. Or so we thought. The musicians remained active an various bands and in 2000 vocalist Steve Whiteman, guitarists Ronnie Youngkins and Brian Forsythe, drummer Jimmy Chalfant plus new bass player Mark Schenker tested their appreciation locally. In 2008 they played the big Rocklahoma Festival plus Rock the Bayou in Houston, all with flying colours. A new album is in the making, but this live CD/DVD is the first for the band, so they chose the familiar waters of Rams Head in Baltimore, MD. The voice I instantly recognizable, as Steve was in FUNNY MONEY in the interim. The drive in the guitars is enviable, and it seems the band has more material to chose from than I remember. The mix of sleaze with a punky attitude, through to slick refrains for sing-along moments and the ever so contagious hit ballad of theirs is the stuff that magic is made from. Their finest moment to me is “Cold Blood”, but “Blow My Fuse” has a dirty approach, and “Girl Money” is straight to the point. The final chat with the audience in “Yeah, Yeah, Yeah” is a bit much to stomach at times, but the band oozes happiness on stage. Welcome back, to a perhaps as longish spell in the limelight as the first attempt?